PRP is a filler that is injected directly into the skin to restore the suppleness, radiance, integrity and skin texture. It adds support and thickness to the skin. It improves the texture of your skin by nourishing it from within. PRP address the superficial wrinkles and crepey skin. For years, PRP has been used extensively in sports medicine to facilitate repair to ligament and tissue injury. This therapy is now a state of the art beauty treatment. "I was ultimately impressed with PRP. My professional skepticism is a duty, as always, so when I see results, I'm confident about reporting them." "I always felt there was something missing between where we inject dermal fillers and the skin, this is the missing link." Is PRP different than dermal fillers? Yes, PRP is quite different than hyaluronic acid fillers such as Restylane and Juvederm. PRP does not replace hyaluronic acid fillers - it compliments it. We use hyaluronic acid fillers to restore the loss of volume in the deeper areas and to improve the folds and deep creases. PRP is used to address the skin itself, the superficial crepey skin that is difficult to address with fillers. Don't forget PRP's main goal is to stimulate fibroblasts and develop long-term collagen formation in the dermis. Any plumping in the treated areas may slowly be absorbed into the dermis creating a platform for better skin and a more healthy appearance. The internal essence of the blood inside you contains life-giving fundamental growth factors that are designed to restore and repair your skin. PRP is leading edge technology that utilizes a high concentration of your own biological cells and allows them to naturally promote skin health. PRP stimulates the rebuilding of the underlying structural integrity of your skin. With a simple and quick process, your own plasma which is taken from your blood is safely prepared on the clinic's premises and reintroduced to your skin within the same treatment session. PRP is regenerative medicine and works best aesthetically when the plasma is introduced into the skin. Your own enhanced concentration of cells will then work with your body to naturally promote a process for new tissue and collagen growth. After the treatment patients often notice fine lines and wrinkles have softened and the skin has a suppleness and radiance about it, overall looking plumper and smoother. However, according to studies, the main goal of PRP treatment is to stimulate fibroblasts and develop long-term collagen formation in the dermis. Any plumping in the treated areas may slowly be absorbed into the dermis creating a platform for better skin and a more healthy appearance. Overall, results are gradual and will vary from person to person based on health, age, and genetic make-up. Most patients enjoy quantifiable improvements in the skin complexion, texture, and tone. Usually within three to four weeks subtle improvements can progressively continue and results improving over three to six months. Virtually any area of the body can be treated, such as : face, neck, hands, chest, and scars, etc. Although all areas on the face can be treated, the most common areas are around the eyes, around the mouth, lips, forehead, and smile lines. The basic strategy for a PRP treatment program can range from one to three treatments spaced four to six weeks apart. We will discuss your primary beauty goals and I will help you determine the best program for your skin. Results have typically been shown to last 12- 15 months and in some studies even longer. Because the plasma is taken directly from you, there is virtually no risk of an allergic reaction or intolerance. And because the treatment is of a liquid base, there is no risk of lumps or bumps after the treatment. PRP will convince you this is a valuable part of your image maintenance. PRP is non-surgical and uses your body's own plasma; a substance that heals wounds is, essentially, recreating skin. What a lovely thought. PRP is not a volume restorer; it is a refiner of texture. PRP uses the healing properties of plasma to accelerate skin's self-renewal. Typically filler is combined with the plasma treatment, we use filler first to restore loss of volume then we use PRP to address the skin texture. Just remember "supple, glowing, radiant" ... and let the results speak from the mirror! As years go by, aging, stress, hormonal imbalances, and external aggressions such as the sun, cold and pollution play a negative role on the quality of your skin. 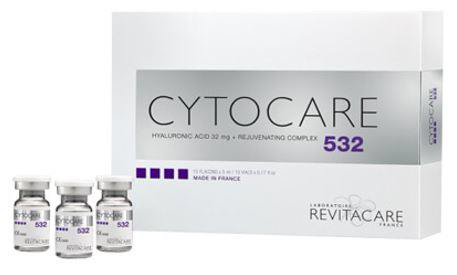 Cytocare utilizes 32mg of Non-crossed linked Hyaluronic acid & rejuvenating complex of Vitamins to rejuvenate the skin. Cytocare is an injection with a treatment protocol of 3 sessions, 3 weeks apart in order to achieve the best results. The treatments can be done on a lunch-hour. Cytocare can be used on its own or it can be used in conjunction with fillers & Botox to bolster and optimize overall results. Common treatment areas are the face, neck, chest, and back of hands. Please click on the thumbnails to enlarge before-after images. Redensityl will change the way people look at you and the way you look at yourself. Teosyal Redensity[I] is an AWARD WINNING Injectable skin revitalizer and anti-aging beauty treatment. Its unique and patented formula is composed of highly concentrated PURE hyaluronic acid, 8 amino acids, 3 antioxidants, 2 minerals, and 1 vitamin – all of which are naturally present in the skin and work synergistically to redensify and hydrate the dermis. "Think of it as an extreme hydrating facial - Via an injectable application"
Over time our skin is affected by internal and external factors that leads to an increase in free radicals and a loss of luminosity in your skin and therefore – fine lines, wrinkles, dull complexion, dehydration, textural changes, and thinning of the dermis become apparent. With this exclusive formula of Redensity[l] the tissue becomes restructured, cellular regeneration occurs, and the auto-production of collagen is stimulated to help restore volume, smoothen out wrinkles, and enhance skin glow. This cutting-edge skin booster injection is for clients that want measurable improvement with subtle and natural results to gently restore thickness to the upper layers of the skin; Redensity[l] targets the delicate areas often ignored by traditional fillers and other wrinkle treatments. Its unique formula is injected right under the surface of the skin in a micro-injection fashion, the formula then blends seamlessly together to cover the treatment area. When starting your Redensity[l] treatments - a protocol of 3 sessions spaced at 2-4 week intervals is required. Visible & cumulative results start from the first injection session. Cumulative results continue to improve for up 1 one month after the third treatment. To maintain your results, it’s best to have a single treatment session approximately twice a year.